Mushroom Model Publications is based in the U.K. All their books are printed in English by their associate Stratus in Sandomierz, Poland. Stratus also prints their own books in Polish. This book is hard-bound of 43 pages in 8 ¼” x 11 ½” page format. Dave Douglass, as an illustrator, aircraft nut, plastic modeler, and Photoshop professional, created the artwork in this book with all of these disciplines combined with a lifelong obsession with WWI German aircraft and markings. More specifically, the Albatro D Series biplane fighter. The Albatros is perfect for the genre of aircraft profile art. Not only because of its beautifully finished fuselage of varnished plywood, painted metal fittings, pleasing shape, and a variety of factory finishes, but because of its various Jagstaffe and personal markings. The DI and DII started their operational careers at the same time as the formation of the Jagdstaffen. These Jagdstaffen adopted individual markings to distinguish themselves at the same time that more pilots were adopting personal markings for the same purpose. This produced a seemingly endless combination of colors and patterns. The color profiles In this book are printed covering the whole page and are across the 11 ½” height of the pages. You have to turn the book sideways to look at them. They were started by Douglass in February of 2011. He created them on an Apple Max Pro using Photoshop. The methods employed are very similar to those used to create technical airbrush art using frisket masks. Very few “automatic” Photoshop techniques were used and no 3D modeling was employed. They are strictly interpretations. Black and white photos were used as a primary source along with published research and correspondence with WWI markings experts. The colors used are based on research accumulated by many authors and enthusiasts, first-hand accounts, interviews with veterans, combat reports, and surviving relics. The study of color used on aircraft from the Great War can never be exact, as has been noted by many authors who have written about this subject. The paints, dopes, and pigments on surviving relics are subject to natural weathering as well as changes to carriers and protective varnishes used. First-hand accounts can be equally open to interpretation. Seemingly specific color references such as “Brunswick green” or “Venetian red” can provide a large range of variations. Familiarity with artist color theory can only help point out the many possibilities rather than find an exact match. Photographic practices of the time also make any conclusions difficult. Orthochromatic film can make light colors seem dark and dark colors seem opposite. Blue and yellow are especially troubling. Lighting conditions make this even more difficult. Photographs of the same plane taken at different times can be very enlightening. Lastly, many of the surviving photos are copies of older photographs which themselves may have faded or otherwise changed over the years. It can never be assumed that any print is made from a negative in perfect archival conditions. 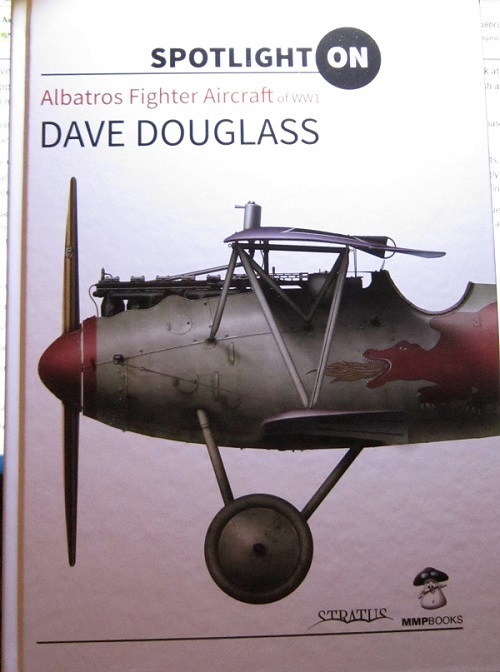 Each of the 43 pages in the book have a color profile of the Albatros on them. The color work is spectacular as schemes on these. I highly recommend this book to WWI aviation enthusiasts and modelers. I sincerely want to thank the folks at Casemate who sent me this book for review and Dr. Roger Walsgrove Editor-in-Chief of MMP. The U.S. distributor of MMP books is Casemate Publications.